At the end of my son’s last high school summer baseball season, I was struck by the number of players who had graduated and didn’t know yet where they were going to attend college. I heard a lot of talk from parents about “maybe walking on” to various teams and see what happens. These were good players, the majority better than my son who did know where he was going. I got the feeling that many of them thought that their sons would, at the very least, already be committed to a team, if not holding an actual scholarship. Given the teams they were talking about walking on to, it was obvious that they had spent the last four years watching their sons play baseball without ever really understanding the realities of college baseball scholarships. The fact that it was the summer after their senior year indicated that they weren’t necessarily up to speed on college application and financial aid deadlines either. So if your son is playing high school baseball, even if he is only a freshman, it’s time for a reality check. 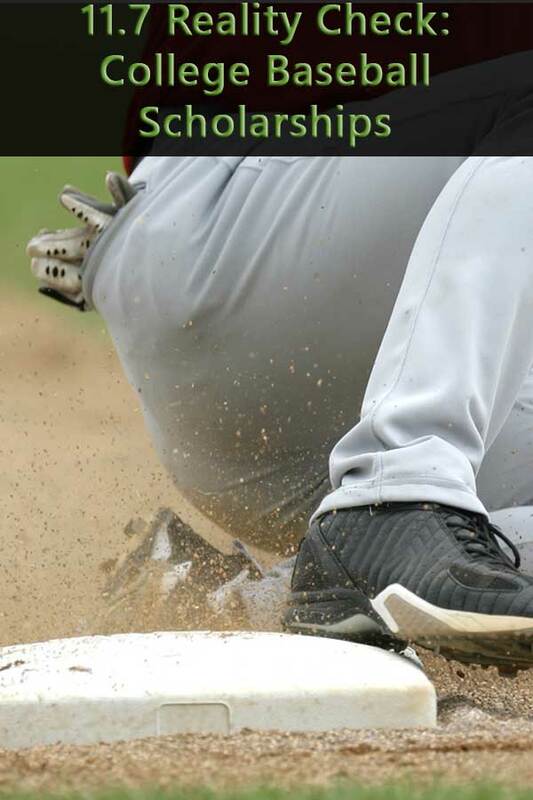 The odds are that your son IS NOT going to get a full ride to college playing baseball. 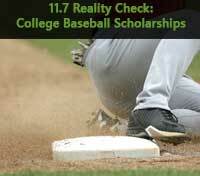 11.7 is the maximum number of scholarships that NCAA Division 1 baseball teams can give to its players. That’s not per year, that’s per team for all players. Most D1 teams carry more pitchers than the number of scholarships they can award. To make the money go further, many coaches award partial scholarships. Depending on the school, this can still leave you on the hook for a hefty chunk of the tuition bill (thus the need to know financial aid deadlines). So if you’re investing money in lessons and select/travel ball in the hopes of a full college baseball scholarship, then you’re making a poor investment decision. It’s simply a matter of numbers. The following table is for the NCAA based on data from the Office of Postsecondary Education for 2016. Given some schools’ reclassification and missing data from others, these aren’t exact numbers but still give you an idea of the odds. Junior Colleges (JuCo) are allowed to award up to 24 scholarships and NAIA schools allow 12 scholarships. This doesn’t mean that your son won’t play college baseball, it just means that you shouldn’t be counting on a full ride scholarship. Then again, unless you understand your son’s actual talent level and his ability to compete on the various college teams, just playing on a team may not happen either. Do yourself and your son a favor and go look up the roster for one of your area colleges’ baseball teams. Now take a look at the seniors. How many came directly from high school and how many are transfers? If most of the seniors are junior college transfers, what do you think the chances are of a freshman out of high school making it to his senior year on the team? Next, take a look at the names of the colleges that the players transferred from. What kind of competition do you think exists at these junior and community college baseball programs? Chances are that they aren’t desperate for quality baseball players. Think about it. How many high school players have less than stellar grades and decide to attend a junior college instead of a four-year institution? Then there are the players who were actually drafted by a MLB team that decided to play JuCo for a year to improve their draft position for the following year. Players at four-year schools cannot be drafted until their junior year which is why these players are at the JuCo level.